One issue in parrot care is that in spring time many pet parrots become breedy. Days are longer and the diet is often richer and more varied than during the winter season, as fresh greens, herbs, fuits and vegetables become abundantly available. All this signals to our birds: perfect time to have some babies. Whilst this is in principle a romantic notion, for pet perrots this can be problematic. 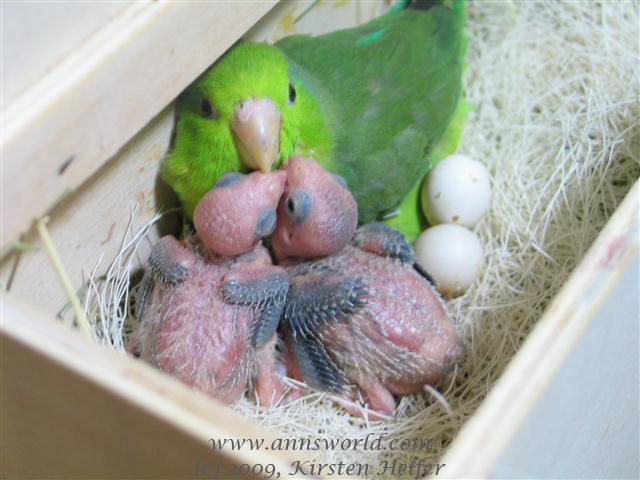 Female parrots can turn into permanent egg layers. This is not only detrimental to their health, but may even be life threatening, if the hen becomes egg bound or has a cloacal prolapse. In addition, breedy parrots may become highly territorial and aggressive. Even if you and your parrots were in harmony before, breediness may result in them defending potential breeding spots against humans and other animals. Therefore, it is often advisable to prevent breediness in parrots or at the least to shorten its duration. Several measures may be carried out to achieve this. I present them here for you in the order in which I recommend implementing them. Available breeding locations may set-off the breeding instinct. If breeding locations are not available, many parrots will not even get the idea to raise young. This is, by the way, an important approach to parrot conservation efforts. Often provision of nesting sites is an integral part of conservation programs. Therefore, you need to get rid of any breeding locations that are available to your parrots. This includes getting rid of nest boxes, but also of any other locations that the parrots might think suitable for breeding. Such locations may be drawers, but also corners, behind doors or under sofas. You need to barricade access to these locations, if you cannot remove them altogether. ATTENTION: If your parrots are already breedy and laying eggs, you must not remove the breeding locations. Doing so could lead to egg binding. In the tropical areas from where our parrots derive, days and nights are of equal length. Having longer days can cause physical and mental problems. Regarding breediness, not only days that are to long, but also lengthening days, may be triggers. You may alleviate this problem by gradually shortening daylight hours with blinds or drapes in the parrot room. The goal is to allow your birds twelve hours of undisturbed nightly rest. Darkening the room and then having the TV run until late at night is not appropriate. how would you feel, if you wanted to sleep and your flat mate or partner was watching TV in the same room? Not really great, right? Parrot breeders who focus on productivity, keep their birds in barren enclosures. With no toys and nothing to do to keep busy, the animals have little else to do, but eat and breed. For parrot owners who want to avoid breeding, this of course means that you have to do the opposite: Keep ’em busy! Breedy parrots get extremely busy. After all as hole breeders they must prepare tree hollows as their nest. Thus, one or two toys will not do the trick. Try stuffing their cage with fresh branches. Another trick that has worked very well for me is to provide, according to the size of the bird, paper bags, cartons or plywood boxes. The trick is, that the animals work hard to prepare a nest site which is destroyed in the process, before they get to the egg laying stage. For a pair of breedy African grey parrots, I have to use up two two cartons per day. Parrots often breed around the rainy season. After the rainy season, the hormones seems to settle right down again. It is not quite clear how this works. Maybe it is just the energy and time expended to bathe and get dry again. But, simulating a rainy season often helps with breedy parrots. Thus, whatever the reason maybe why it works, it is worthwhile to try this strategy. To do this, you provide the bird with a drenching shower three to five times per day. Please make sure, though, that the birds have a chance to dry themselves again, before sleep time. I would like to point out that showering the bird has nothing whatsoever to do with punishment which I wholeheartedly reject. Rather we are talking about the simulation of a seasonality that happens in the wild. There are various homoeopathic remedies which are supposed to help curb exaggerated egg laying that is detrimental to the hen’s health. They work with varying success. Nevertheless, they are worth trying before resorting to giving hormones, as the side effects are much less. You need to discuss this with your avian vet who can best assess how critical the situation for your female parrot is. For permanent egg layers nutrition, especially the provision of calcium, is highly important. The eggs will provide the chick with all nutrients needed, until it hatches. All the nutrients provided int he egg for the chick are drawn from the hen’s body. You can imagine, how much permanent egg laying may deplete the hen’s body of nutrients and weaken it. LAck of calcium may lead to egg binding, a potentially fatal condition. The supplementation of minerals and vitamins should be discussed with your avian vet. The treatment of permanent egg layers with hormones is a measure of last resort as they can have substantial side effects. Nevertheless, hormone treatment may save a permanent egg laying hen from death. The decision as to when to begin with hormone treatments should be made by you and your avian vet. Quite often I see advice given on internet forums and mailing lists to reduce the amount of food provided to curb egg laying. In principle, it is true, that rich food, in particular a change from scarce diet to an abundant one, may trigger breediness. However, using this method in practice is dangerous. Parrots have a high metabolism. Furthermore, through the feathers it is difficult for most owners to accurately judge the nutrition state of their birds. Ten percent weight loss are a warning sign, twenty percent may be life threatening. In addition an egg laying hen needs all the nutrients she can get. Therefore, I would strongly advise against food reduction as a method of preventing breediness and egg laying.